It has been so hot here lately that I am not going to apologize for the large number of recipes that I am posting that use an outdoor grill – there is no way I am wanting to turn the stove on right now! If you don’t have a grill, all the recipes I have been posting could certainly be cooked in a skillet or under the broiler. I am sure they would taste just as good. One of my favourite things to cook on a grill is shrimp. And shrimp also happens to be a very economical seafood, which is why we eat it quite a lot. These grilled shrimp were just delicious. I marinated them for a short time in a mixture of lime juice, honey and garlic which gave them a wonderful flavour, and the honey contributed to the caremelization on the surface. I served these on top of a mango and strawberry salsa, meaning that the entire recipe is AIP friendly and suitable for the elimination phase of AIP. If you are not AIP and can handle some chili, a chopped jalapeno chili would be wonderful in the salsa! The first thing you need to do is to take some wooden or bamboo skewers and soak them in cold water for a couple of hours – this will stop them from burning on the grill. Place the lime juice, honey, fish sauce, olive oil, garlic, ginger and salt in a pan and bring to a simmer. Cook for 5 minutes then leave to cool. Divide the marinade in half, and pour one half over the shrimp. Cover and refrigerate for half to one hour. Keep the remaining half of the marinade to one side to use as a glaze. While the shrimp is marinading, make the salsa. Chop the mango, strawberries and avocado into evenly sized pieces and place them in a bowl. Add the cilantro, green onions, lime zest, ginger and garlic, and season well with salt. Mix well then pour over the olive oil and lime juice. Give it all one final mix then store in the fridge until needed. When ready to cook the shrimp, preheat the grill to medium hot. Thread the shrimp onto the soaked bamboo skewers (I like to use 2 skewers for each as they hold the shrimp securely and makesthem easier to turn). Grill the shrimp for 2-3 minutes per side, brushing well with the reserved marinade. 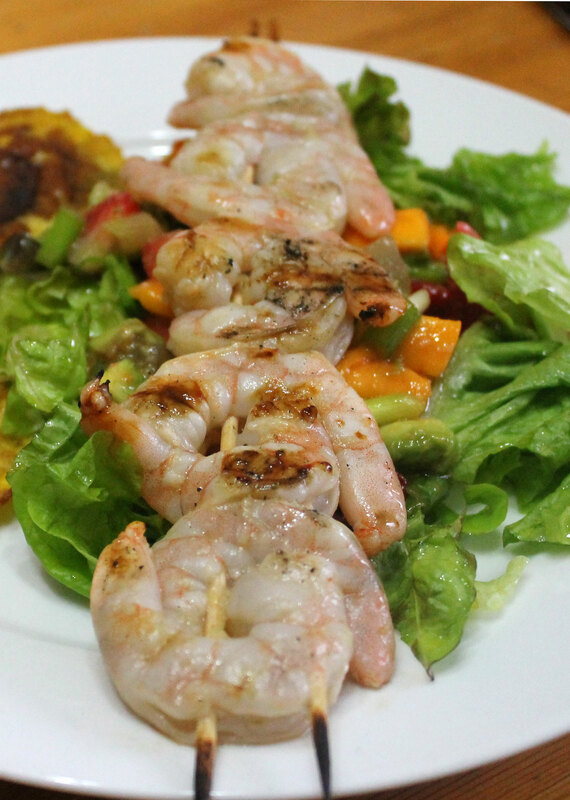 Remove from the grill once the shrimp is pink and opaque and serve at once with mango, strawberry, avocado salsa. 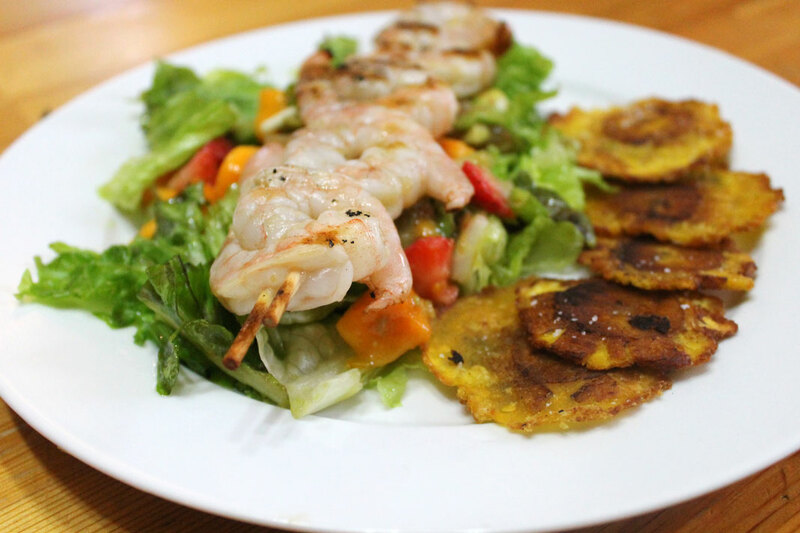 I like to put a bed of lettuce on a plate, top this with the salsa and then sit the shrimp skewers on top. I served this with some tostones made from green plantains. 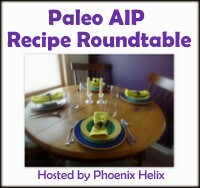 This entry was posted in Autoimmune Protocol Foods, Paleo Autoimmune Protocol, Recipes and tagged AIP-friendly, auto-immune protocol, grilling, paleo, primal, seafood, shrimp. Bookmark the permalink. Oh my gosh, Charlotte, even on a full stomach this sounds incredibly delicious and doable for a “not so good” cook like me. I’ve got it on my list for tomorrow. Am I missing a printer friendly button? I want to keep this one! If you message me with your email address, I can mail you a word document of this recipe that should be easier for you to print out – email address is salixisme at gmail dot com. And yes this was a very easy meal – most difficult thing was threading the shrimp on the 2 skewers – it would be even easier if you just used one! No shrimp in freezer, but I do have scallops. And this sounds great for those scallops! Thank you!!! I’d love that print friendly add on too. But don’t know how. I’ve just been printing off your posts normally, and they print off adequately enough. Have a great weekend! I imagine this would be great with scallops as well! enjoy! Came back to say it was a hit for all! We loved the sauce and salsa. No shrimp available but I used scallops and some mahi-mahi chunks. Most excellent. The ginger just made it all pop! Thanks for the feedback. I am glad that you enjoyed it. I will have to try using scallops next time I make it. The whole family loved it ! Thank you so much for this delicious recipe!